We have been hard at work in the CBC design office creating beautiful bedroom furniture for children, teens and young adults of all ages. Introducing four brand new collections of bedroom furniture; The Cheyenne collection, The Armada Collection, The Sierra Collection and The Savannah Collection. Brand new and beautiful. Breaking away from our traditional ranges our new collections of kids furniture are bound to add a burst of excitement in your little ones bedroom. Exclusively designed and manufactured in the UK, our designs have been tailored to the modern toddler, child and teenager. 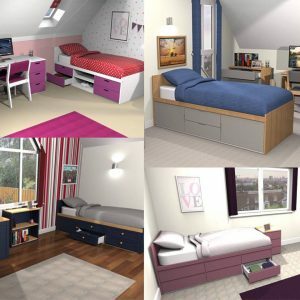 Each collection will fully kit out your children's bedrooms with everything that they need, every bed has a matching wardrobe, chest of drawers and desk! We have a host of storage options available to you to ensure that no space is wasted. Every collection has different storage options, whether that be beds with open shelves and drawers, or our classic 2 cupboard and 2 drawer combination there is a wide range to choose from to ensure that you can select a storage option that is most suitable for your bedroom. There are 2 types of beds in this range, cabin beds and storage beds. Both styles add heaps of practicality in terms of storage and style. All drawers are set on metal easy glide runners to ensure maximum durability and handles have been designed to with stand the rigours of daily use. We understand that each bedroom differs, and everyone has their own personal style. Our collections are available in a range of colours ensuring that every bedroom is individual and personal. Choose from Flamingo Pink, Stormy Blue, Elephant Grey, Arctic White or Strarlight Pink. Colours on the website may vary, so to be extra sure on the colour you wish to choose we would suggest requesting a colour sample from our team. As an introductory offer all of the items in our fantastic new ranges are now 30% off! Any item of furniture including beds, wardrobes, desks, storage cabinets and more are now discounted. We are sure that you little one will find a collection that they will love. Our range of beds will be ideal for re decorating in the New Year, all of the items in the collections are matching meaning that you can create a decor that suits your little ones style whilst also providing them with plenty of storage space. All beds have been designed to create a contemporary look that will fit with most decors plus with the choice of colours available you are sure to find discover something that matches your personality and style to a T! We also provide FREE assembly, meaning that you don't have to worry about missing screws and parts or worry about understanding confusing instructions. Our team will assemble your items free of charge in the room of your choice. If you would like to find our more about our new bedroom collections, feel free to call our team who would be more than happy to help!